With yesterday behind me, I have everything ready to go. Preparation isn't a problem I have everything ready to go, but I don't have the glider setup. I'm ready to jump in line for the early bird launches but need to see the weather first. at the pilot meeting I get called upon because of the string of bad luck on the day previously. I get called up 3 different times and walk away with three Tshirts. A nice gesture from the organizers. Weather seems overcalled again, with Larry Bunner calling for another 10k day. I see much lower, but hope for the best. During the meeting the organizers ask who wants to volunteer for early bird, my hand goes up. I'm not going to get stuck on the ground again so what's the worse that can happen? Phill, Ron, and I get a good setup spot in the grass on the edge of the tow field, actually we're on the edge of the golf course under a tree. I'm stuffing battens like a mad man, because the early bird launch opens in 15 minutes. One of the launch crew brings me a cart so I can suit up and get right in line. That was a big help. In a hurry, but mostly setup, I get a final radio check and get in line. I'm greeted by the same launch crew that saw me through my ordeal yesterday. We have a small joke and I tell them that I don't need anymore Tshirts. The launch direction has the wind 90 degree cross, I've seen several launches and the deal is just stay on the cart longer than normal. I let the wind die a little although I'm contemplating moving the launch to a better direction since I've been given the option. I take the launch where it is and have a long roll, but come off the cart fine. However, in very short order I see that the "one" thing I've hurried through during the preparation is I did not pull any VG for the tow. I tough it out for nearly the entire tow but pull off a little early. Jim pulled me through a couple of good lift areas and I think I know where they are and go for them. I find some of it and slowly climb to about 3k I finally decide to go back to the field and look for something better. Hitting massive sink, I'm thinking I might need to land, but if I do, I assume my original launch position, so I desperately DO NOT WANT to land if I can help it. About 500' over the deck, I see that I have a few chances to make it work when I spot a redtail hawk climbing just to my east. I adjust and he's marked my saving thermal. I finally connect and make a couple of up and down moves. Shared a climb with Phill, and Gregg at one point with some time with Larry Bunner and Zippy early on. 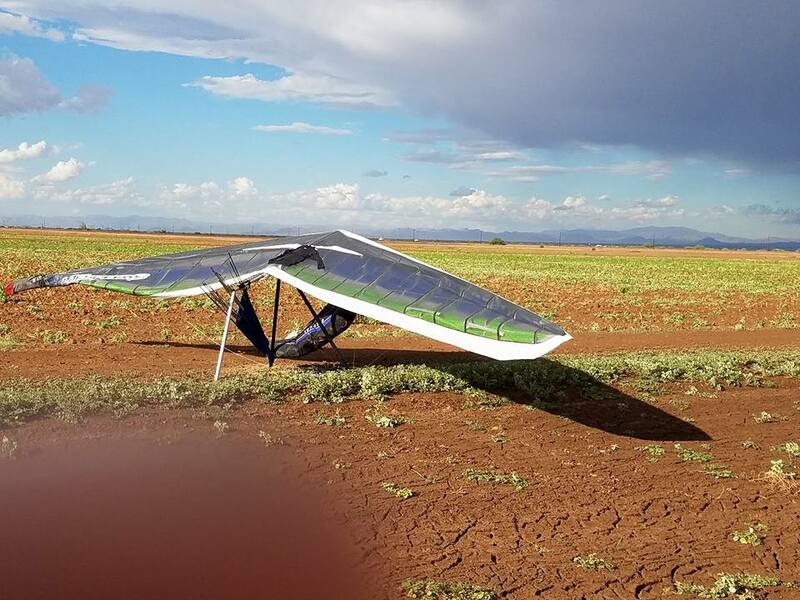 Keep in mind, I've launched 1.5 hours before the start of the task start, so I need to just fly conservatively until it's near the time for the start of the race which begins ay 13:45 with 2 other starts 20 minutes apart. It doesn't look like anyone is in position for the first start. I'm COMPLETELY by myself North of the start cylinder, but climbing through 7k, 8 minutes before the 2nd start, but 4k North, so I need to get back to the start cylinder. The DigiFly vario does a good job of keeping me apprised of the situation and I start 1.5 minutes after the 2:05 start time. 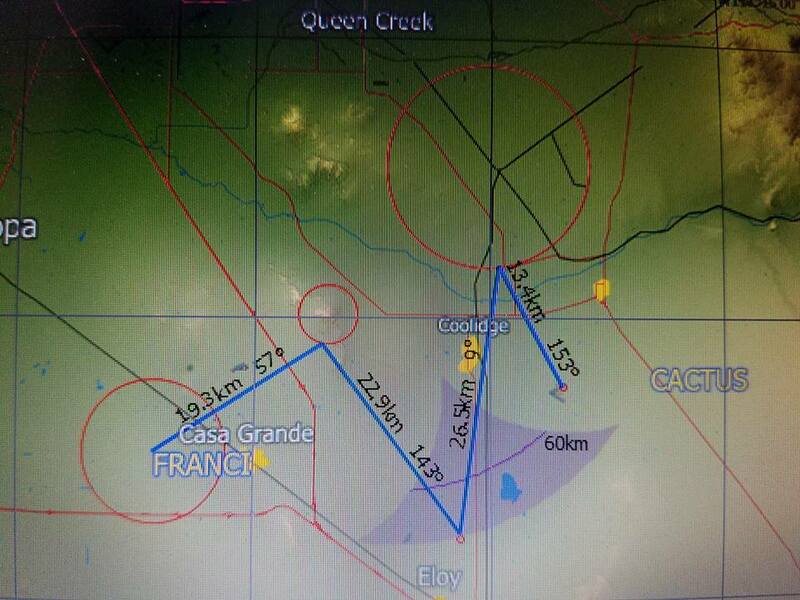 With a short 12k glide to the first tp, I meet up with several pilots that started south of the start cylinder. 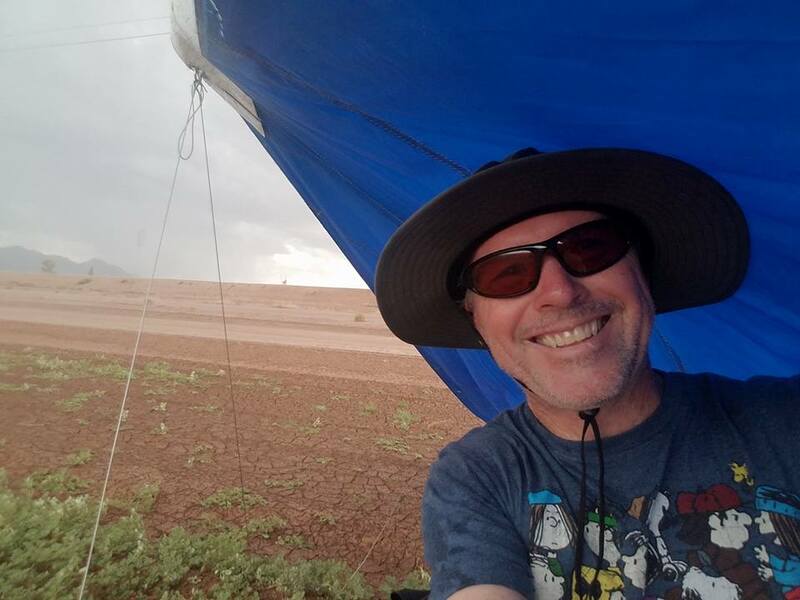 Everything is going pretty well except to our southwest it's dumping rain with small gust fronts, but nothing wide spread. 2nd tp is 22k away and in the shade now. 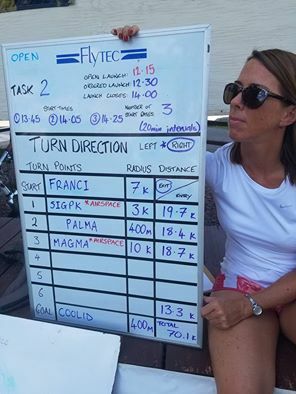 I adjust east to stay just under the shade line and I'm rewarded with a climb to 8k, I'm just 10k from the tp but have to push slightly upwind to tag the 400m tp cylinder. As I come in, I see others headed the other way at my altitude. Just SE of the tp, I spot some rising dust clouds from tractors plowing a field. Thinking this might be better than just heading back north with the group (mistake), I use my own bird brain and go to the rising dust. Searching the field I come up dry and head back north with plenty of landing options. 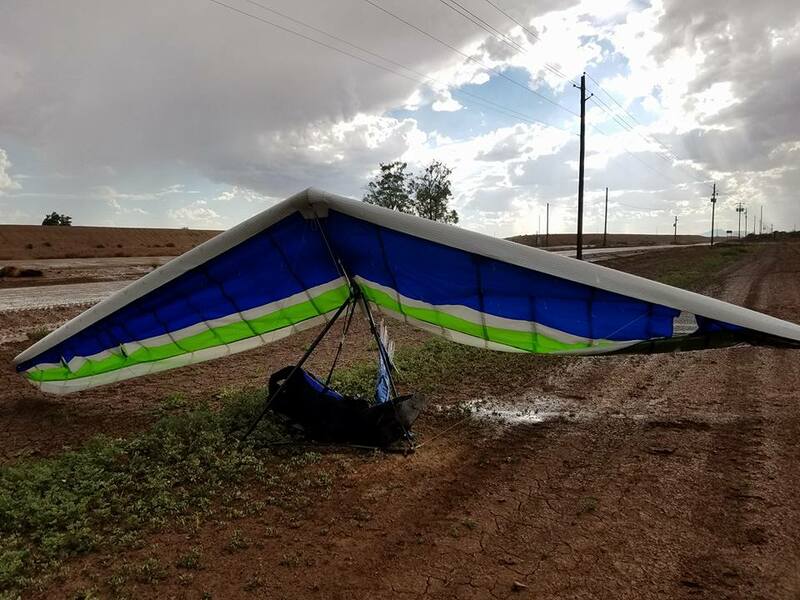 I retrospect, I would have chosen a field with more grass since I got ponded on by several downburst where I had to use my glider as an umbrella. That was OK, except now the field or side of the field I was on, turned to slick clay/mud. It took a while for the guys to get me. But it wasn't all that bad. 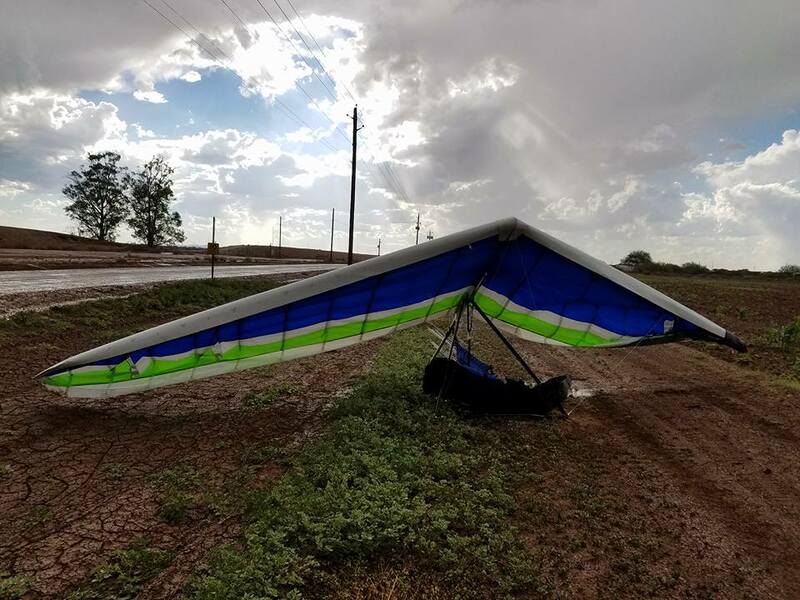 The rain cooled off everything, got to hear some awesome thunderclaps and got to see my nearly broken down glider get flipped over (broke one batten and had to clean it up a bit). Its more than a little muddy after that downpour. Nice account Chippy. The only thing I can add is that my pilots are taking good care of me. I'm in one of two states: driving... or no conditions to do so.